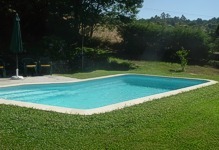 Casa da Morada is a former single storey farmhouse which has been restored to give an excellent holiday home. There is an ample open plan living area with a fireplace and French windows leading to the garden. The room has a television, video and a music centre. Steps lead to the raised dining area with seating for up to 6 persons. The fully equipped kitchen has a hob, oven, fridge, freezer, microwave, dish washer and a juice extractor. The master bedroom has a double bed and an en-suite shower room. There are two twin bedrooms with hand made furniture and a separate bathroom. The house has a large garden with splendid views over the Coura valley. The back of the property has many trees which provide shade on hot days. The swimming pool is 8.5 x 4.5 metres with a depth varying from 0.60 to 1.80 metres (salted water). The small town of Paredes de Coura which has shops and restaurants is about four kilometres from the house. The old Roman town of Ponte de Lima with many bars and restaurants is 25 kilometres away. Casa da Morada is close to the many areas of beauty of the Minho region such as the Peneda Geres National Park with its vast green landscapes. About 25 kilometers away is the walled, border town of Valenca which offers a wide selection of shops and restaurants within its fortifications. There is a weekly market held on the road leading to the old bridge. Thanks to the new motorway system you may also care to visit Vigo, Baiona and Santiago de Compostela in Spain and the Portuguese cities of Braga, Guimaraes and Porto.